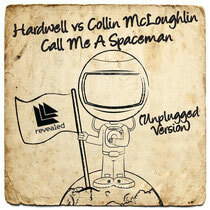 Hardwell, who was recently named the #6 DJ in the world by DJ Mag Top 100, recently announced the winner of his ‘Spaceman’ competition as Collin McLoughlin. Also, he’s jut released an Electric Zoo aftermovie. Hardwell asked his fans to submit an acoustic version of his single, ‘Spaceman’, for the chance to have it featured in his Electric Zoo after-movie. Additionally, the winner, Collin, is seeing full support from Hardwell, wins VIP access to a Hardwell show of choice and a meet and greet with Hardwell. Hardwell delivers his Electric Zoo after-movie that showcases his emotional journey to New York City that culminates into his main stage performance. He also stays true to his word and includes Collin McLoughlin’s elegant rendition of ‘Call Me A Spaceman’ as the soundtrack.